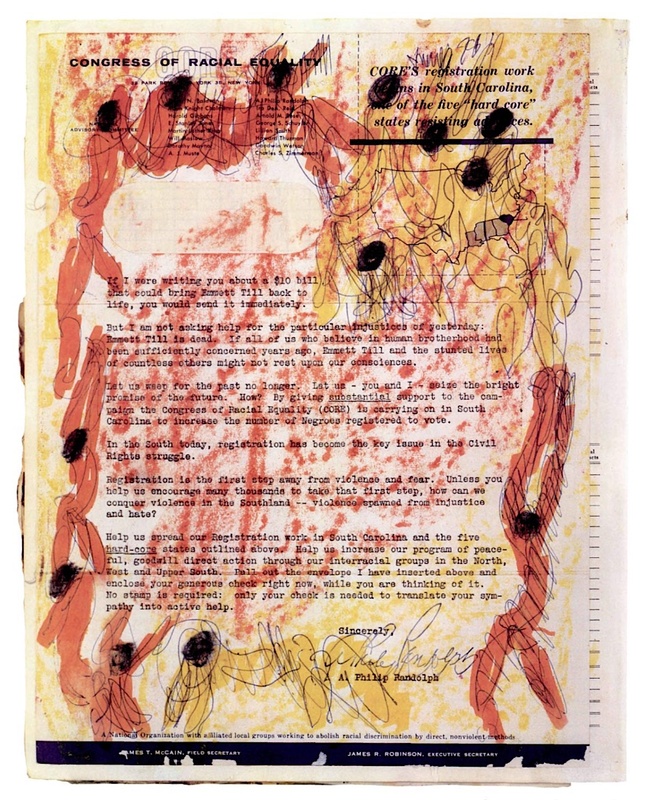 In the late 1960s, Young began collecting discarded books, magazines, and papers of all kinds to make his own books of sketches and observations. In the late 1960s, Young began collecting discarded books, magazines, and papers of all kinds to make his own books of sketches and observations. One page from these books is made of a Congress on Racial Equality (CORE ) fundraising letter that summons the memory of Emmitt Till's murder. Young has glossed the letter with a funeral ring of mourners. Young's outrage at our era's hypocrisy and injustice binds together the many figuralisms: the conjure book of expressionist painting styles, the conjure book of the Bible, and the work-in-progress conjure book of American history.